KIDS AND ADULT: Read the recipe and then gather all the ingredients and equipment needed. ADULT: Chop the onion and tomato using the knife and cutting board. Open the cans of broth, beans and chicken using the can opener. KIDS: Measure the pasta using a 1 cup dry measuring cup. Pour the beans into a strainer over the sink. Rinse the beans with cold water and drain. Measure the oil with a 1 tablespoon measuring spoon and pour into a 6-quart saucepot. ADULT: Put the saucepot on a burner set to medium-high heat. Add the onion and cook until the onion is tender, stirring occasionally with the wooden spoon. KIDS AND ADULT: Pour the broth into the saucepot. Measure the garlic powder using a 1/4 teaspoon measuring spoon and add to the saucepot. Increase the heat to high. Heat to a boil, stirring occasionally with a wooden spoon. Add the pasta and return the broth mixture to a boil, stirring occasionally. Boil for 5 minutes. 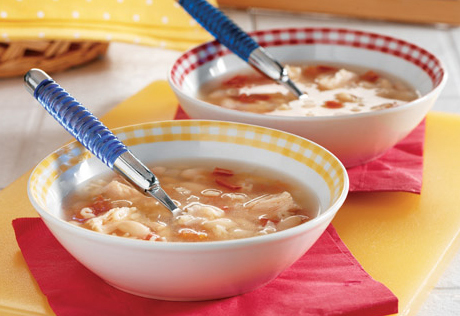 KIDS AND ADULT: Add the beans, tomato and chicken with its liquid. Reduce the heat to low. Cook for 5 minutes or until the pasta is tender. KIDS: Remove the toast from the package and place it on a baking sheet. ADULT: Bake the toast according to the package directions. KIDS AND ADULT: Remove the toast from the baking sheet with a pancake turner and put it in a napkin-lined serving basket. Ladle the soup into serving bowls and serve with the toast.